Poisoned with a chalice of Arsenic as he feasted, the recent passing of Danish monarch KING FREDERICK has brought to a light a most Disturbing trend across the great Atlantic. 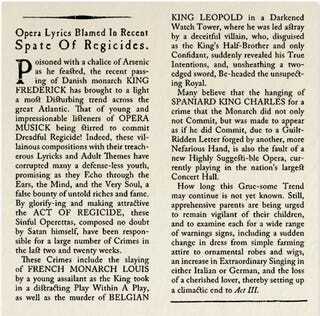 That of young and impressionable listeners of OPERA MUSICK being stirred to commit Dreadful Regicide! Indeed, these villainous compositions with their treacherous Lyricks and Adult Themes have corrupted many a defense-less youth, promising as they Echo through the Ears, the Mind, and the Very Soul, a false bounty of untold riches and fame. By glorify-ing and making attractive the ACT OF REGICIDE, these Sinful Operettas, composed no doubt by Satan himself, have been responsible for a large number of Crimes in the last two and twenty weeks. These Crimes include the slaying of FRENCH MONARCH LOUIS by a young assailant as the King took in a distracting Play Within A Play, as well as the murder of BELGIAN KING LEOPOLD in a Darkened Watch Tower, where he was led astray by a deceitful villain, who, disguised as the King's Half-Brother and only Confidant, suddenly revealed his True Intentions, and, unsheathing a two-edged sword, Be-headed the unsupect-ing Royal. Many believe that the hanging of SPANIARD KING CHARLES for a crime that the Monarch did not only not Commit, but was made to appear as if he did Commit, due to a Guilt-Ridden Letter forged by another, more Nefarious Hand, is also the fault of a new Highly Suggesti-ble Opera, currently playing in the nation's largest Concert Hall. How long this Grue-some Trend may continue is not yet known. Still, apprehensive parents are being urged to remain vigilant of their children, and to examine each for a wide range of warnings signs, including a sudden change in dress from simple farming attire to ornamental robes and wigs, an increase in Extraordinary Singing in either Italian or German, and the loss of a cherished lover, thereby setting up a climactic end to Act III.